"Coup de Rouge" is French for "A Touch of Red." The touch of red refers not only to Janet's hair but also refers to our trademark red seed bead at the end of our jewelry. When you see the red bead you can be assured of a quality product and original design work. Coup de Rouge has grown from a hobby into a small business with sales from shows, art galleries, studio visitors, and the internet. 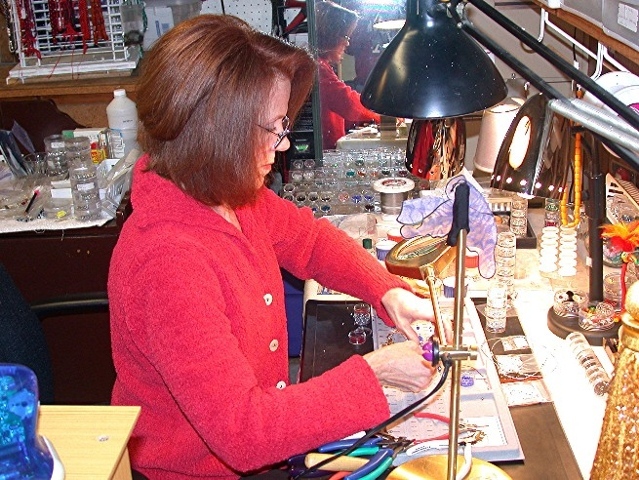 Janet worked for years as a educator of special needs children and transitioned to full time jewelry designing when her orders became too numerous to fill on a part time basis. Since becoming a full time designer her reputation has grown and she is well established in the Missouri Ozarks as an artisan of great talent. Coup de Rouge is the trademark of our limited liability corporation. Our studio is located in Lebanon, MO. Janet works there with her husband, Chris, and three other employees. kind of personal experience that customers of Coup de Rouge have come to expect.